To accompany the child when they start walking. Safe for the baby and very comfortable for parents as it is very easy to hold. The harness has a zip on the lower part so it adapts to the child’s size as they grow. Made from padded and breathable cotton fabric, the same material as that used for papooses. This Evolving harness has 2 in1 stages of use. First steps reins. The child is just starting to take his first steps and parents can use the harness in this position to help the child stay upright and stop him from toppling forwards or falling down. Ideal to prevent parents from straining their lower back. Safety harness. 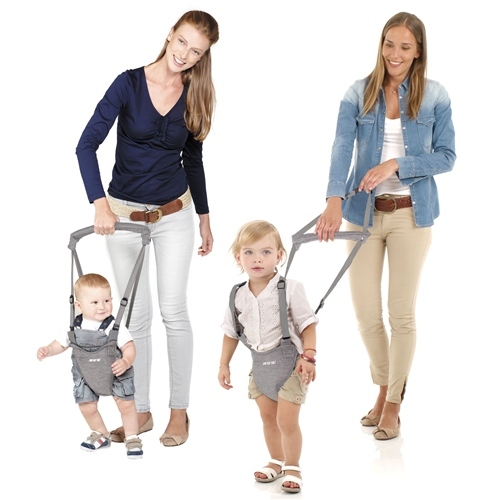 For when the child can already walk and parents want to stop him from wandering off. This product should be used in position 2. This allows the child to walk safely since the adult makes sure he can’t get lost. This is a different type of harness as it goes underneath the child as opposed to just being a chest harness. Provides perfect support to the child and is also a great help with security. The baby canbe prevented from falling over as one can lift the baby upby the harness. My 9 month old son loves walking around, especially chasing our family dog. However it really hurts your back bending down to support him. This harness really does the trick. Is a little tricky to get baby in and out at first, but it is worth it for the smile! I used it for my 5 months old baby and she is happy that can run arround now! Realy good and I no longer have to bend down and get a back ache! Appears save for baby to be in it very similar with the door jumper sistem!